Hunter Hendricks led all scorers with 18 points, connecting on four 3-pointers on the evening. Noah Johnson, who finished with 12 points, helped the Bluejays out to a 14-8 lead with half his points in the first period. Hendricks got going in the second quarter, tallying his first trey and seven points to get West Platte to a 23-point frame and a 37-13 advantage at the break. Phillip Pattison, who finished with 10 points, contributed six points in the second quarter. West Platte outscored the Tigers 17-13 in the third quarter and again in the fourth, 11-4. Trent Taylor added 10 points for the Bluejays. The Bluejays dropped a KCI contest the following day, Friday, Feb. 1, in Plattsburg. West Platte trailed 28-24 at halftime, but Plattsburg dominated the rest of the way, out-scoring the visitors 46-18 in the second half. The Bluejays (8-9) struggled to slow Plattsburg’s Garrett Stephens, who poured in 31 points and made seven 3-pointers. West Platte was led by Pattison, who scored 13 points and converted 7 of 8 free throws. Miles Demayo added nine points on three treys. Hendricks chipped in eight points. 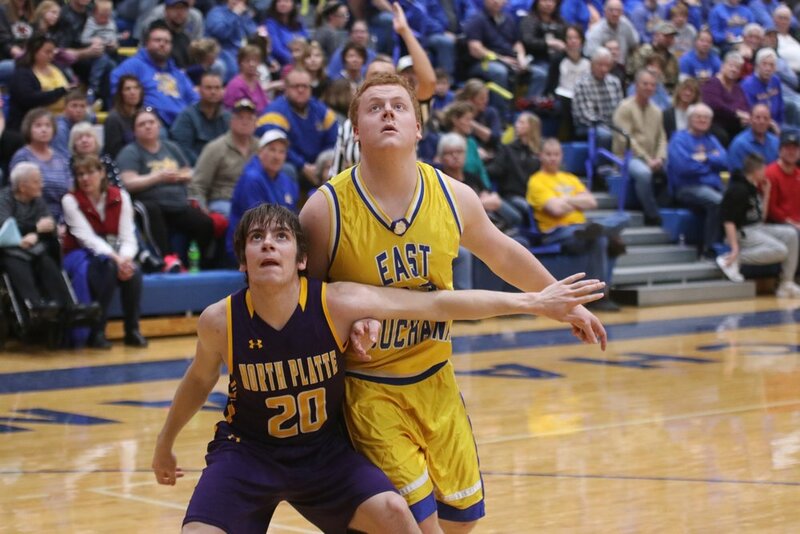 East Buchanan and North Platte continued their respective streaks in a KCI matchup on Friday, Feb. 1 in Gower. Ethan Kilgore outscored the Panthers with 28 total points, as East Buchanan extended its winning streak to 12 straight games. North Platte, meanwhile, dropped its 12th consecutive contest ahead of Tuesday’s home contest against West Platte. The Bulldogs (17-1), ranked third in Class 2 in the Missouri Basketball Coaches Association, started fast, scoring 23 and 27 in the first two quarters for a 50-7 halftime advantage. Kilgore had 22 by halftime. Joel Smyser led the Panthers (1-16) with 10 points, eight of which came during the third quarter. North Platte plays next on Thursday, Feb. 7 at Excelsior Springs. North Platte’s Ty French, left, gets position against an East Buchanan player during a game on Friday, Feb. 1 in Gower, Mo.